Back to Black – The San Antonio Spurs are heading back to the Western Conference Finals for the eighth time during the Tim Duncan era after eliminating the Golden State Warriors in Game 6 of the Western Conference Semi-Finals on Thursday night. 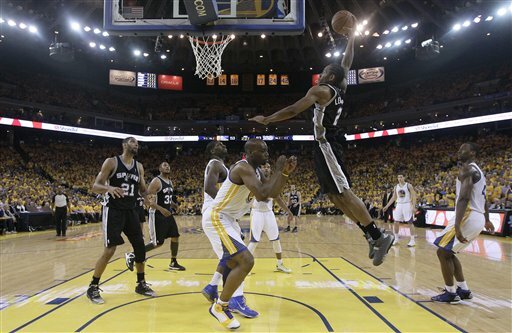 The Spurs defeated the Warriors 94 to 82 at Oracle Arena in Oakland, California to win a hard fought series and squelch the infectious hopes of a nation to see a miracle run by the Warriors to the NBA Finals. The execution of suffocating defensive pressure to win tough close-out playoff games on the road was a staple of the #BlackAndSilver during the team’s dynastic period from 1999 to 2008. During that time, the Spur’s were able to go into an opponent’s building and eliminate said opponent from the playoffs on 14 different occasions. The last of these close outs, eliminating the Hornets in Game 7 of the 2008 Western Conference Semi-Finals in New Orleans, was the last time the Spurs had played elite defense in the NBA playoffs; until Game 5 and Game 6 against the Warriors this week. Back to black, indeed. 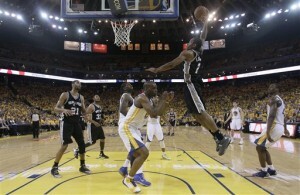 Kawhi Leonard was once again my player of the game. Continuing as the primary defender on Klay Thompson in Game 6, Kawhi held him to 10 points on 4-12 shooting. Not only was his defense outstanding for the second game in a row, Leonard did multiple things well throughout the game to make a positive impact. He shot an efficient 6-13 from the field for 16 points, grabbed 10 rebounds to lead the team, had two timely steals that resulted in transition points, rebounded his own missed three pointer for an emphatic dunk, and he made a cold blooded three pointer in the guts of the fourth quarter with the game on the line and with the Warriors surging on another late game rally. Kawhi has an innate ability to let the game come to him and make an impact in the flow of the offense and he is unquestionably disruptive for opponents on defense. I could not be more thrilled with his development this year and his performance in his second playoff run as an NBA player. Defensively, we need him to keep maturing into the second coming of Bruce Bowen, a defensive stopper who can make the opponent’s best perimeter player work for 48 minutes to put up points. It would be foolish, though, to set the limit on his potential value to this franchise moving forward as only a defensive stopper. Kawhi has the athleticism and the skill set to become a two-way player in the mold of Scottie Pippen. Don’t worry, Mark Jackson, I’ll continue to leave the premature anointing of young, talented players to you. I’m not suggesting that Kawhi Leonard will develop into a player on the level of Scottie Pippen, I’m just proffering that he has the natural ability and skill set to play a two-way game that reminds me of the way Pippen played the game. Kawhi Leonard’s future is blindingly bright and he has the realizable capability to prove himself to be a future cornerstone of this franchise. There is no rest for the weary as the Western Conference Finals begin tomorrow afternoon back home at the AT&T Center against the Memphis Grizzlies. The Russel Westbrook injury proved to be too much for Oklahoma City to overcome, which has robbed the Spurs of the opportunity to avenge last year’s heartbreaking collapse in the conference finals to the Thunder. This doesn’t mean that redemption won’t be in the air this weekend in San Antonio. San Antonio has an opportunity to emphatically put the heartbreak of blowing a 2-0 series lead with home court advantage last year behind them, no matter who this year’s opponent is. Asked during the post-game press conference Thursday night about the Spur’s auspicious opportunity to redeem themselves, Tony Parker said, “We were two games away from the Finals, and this year we have another opportunity to…go to the Finals.” It appears that Tony and his teammates will be mindful of last year’s collapse and be determined to execute better throughout the duration of this series. After this grind-it-out series with Golden State, San Antonio is already better prepared to handle adversity at this stage of the playoffs than they were last year. Persevering through an early-round test was something that I truly believed that the Spurs needed to get back to championship-contending form. We’ve had that now. The Memphis Grizzlies will come to town this weekend bringing with them their own playoff redemption motivation for the Spurs. Memphis shocked the Spurs in the first round of the 2011 playoffs, eliminating San Antonio 4-2. After stealing Game 1 that year against a Manu-less Spurs squad, the Grizzlies became only the second team in NBA history to upset a one seed as the eight seed in a best-of-seven first round series. Manu Ginobili should be healthy and ready to go for Game 1 tomorrow, which makes the Grizzlies task of attempting to steal home court advantage vastly more difficult than it was two years ago. Nonetheless, Memphis has proven to be an outstanding playoff team and is always a bad match up for the Spurs with their interior dominance. This series is going to be a slug fest. Tiago Splitter is going to have to play at an extremely high level for the duration of the series to try to neutralize Marc Gasol and Zach Randolph as much as possible. It will also be critical for Boris Diaw and Matt Bonner to consistently knock down perimeter jumpers to force one of the two Memphis big men away from the basket. The key to the series will be whether or not the Spurs can continue to play Back to Black suffocating defense night in and night out against Memphis and keep the Grizzlies from dominating the glass and getting second-chance opportunities. While Memphis is an elite defensive team, if the Spurs can match their defensive intensity and rebound the basketball, we should be able to grind out enough low scoring tough playoff victories against them to hopefully control the series because we have more offensive firepower. This series will be ugly, but that makes it even more exciting to me. Something feels different with this playoff run than last year. I’m not just saying that as means to psyche myself into hoping for a different result. The Spurs feel like they are getting back to who they were when they used to average under 90 points a game and win playoff games with their defense. After spending the better part of a month out in California getting reacquainted with our heart and soul as a team, the San Antonio Spurs are coming home.